The name is Ribeiro Moraes, a Brazilian striker who made a truly outstanding first half of season in Romania, and was associated until now with CFR Cluj, Steaua, Rapid and FC Vaslui, all title contenders, keen to add such an impressive 23 years old to their roster. Bought by Gloria Bistrita for just 200.000 Euros, the guy basically secured for his team another season in Liga I, with 10 goals scored in 17 matches (was the league’s top scorer in the secod half of the season!) and a series of excellent performances. He’s a striker who has it all, pace, strength, technique, composure, who proveded his ability to adjust to a totally new style of play and environment, who had every reason to hope that he’ll be showing his skills in European competitions next season and fight for the title. Well, as Gloria Bistrita did struck gold on this occasion, the club’s president refused to accept anything below the release clause, which is 2 million Euros, a price that only Rapid was still trying to negotiate, at this time. Poli Iasi – Rapid and Pandurii – Astra will be played, after both home teams have settled the financial problems that had forced the Romanian Professional League (LPF) to announce that these two teams risk of not being allowed to play in the first round. Steaua‘s owner, Gigi Becali, confirmed that the club has finally reached an agreement with APOP/Kyniras from Cyprus, regarding the much negotiated transfer of Senegalese central defender Gora Tall (24). Steaua will pay 70.000 EUR for his loan until the summer and 130.000 EUR for a permanent deal. Roberto De Zerbi (30) is still in Italy, although he signed a contract with CFR Cluj. Coach Andrea Mandorlini is fully aware of the midfielder’s medical problems, who is expected to continue his recovery for at least two more weeks, and will probably leave him out of the club’s most important games of the season. Ceahlaul’s most important transfer, Cosmin Barcauan (31) will miss the debut match, against Steaua, as OFI refused to release his work permit, until the central defender sent an official complaint to FIFA. International Curtea de Arges officially anounced the signing of George Blay (29). The right back spent three seasons in Romania, playing for Dinamo Bucharest, where he was brought by former coach Mircea Rednic, but hasn’t been able to find a team since his departure from the red and white outfit, in the summer of 2009. 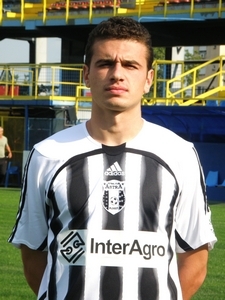 Liviu Ganea (21) returns to Astra Ploiesti, where he had already spent the first half of season, on loan from Dinamo. It seems that the conflict between Astra’s boss Ioan Niculae and Dinamo’s board is history (the wealthy Niculae being a big fan of the Red Dogs!) and now the small club from Ploiesti can count again on two players that left a good impression in the first half of season, Ganea and the full back Eugen Craciun. Half way through the season, Ganea is Astra’s top scorer, with six goals scored in twelve games. Universitatea Craiova signed Ivan Paunovic (23), from Srem. The Serbian midfielder agreed to a short contract, until the end of the season, but with an option to extend it for four more years. Interesting enough, the player brought in Romania by FIFA agent Marcel Popescu had been training for the past couple of weeks with Astra Ploiesti, but failed to agree terms when it came to put pen to paper. Although his move to Ceahlaul Piatra Neamt was officially announced, Vasile Buhaescu (22) switched sides today and went on loan to a second division club, Concordia Chiajna. The striker, a former U21 player for Romania, belongs to FC Vaslui, but would have had no realistic chance to feature in the second half of season, given the tough competition for a place in the team and the club’s ambition to try and mount a serious title challenge. Dinamo and Astra Ploiesti, teams that were sharing the rights of two players, Georgian Paun (24, forward) and Eugen Craciun (23, full back), found an agreement that makes Paun a Dinamo player and transfers Craciun to Astra. If Craciun will continue to play for Astra, where he was on loan for the past two years anyway, Paun was re-directed to Politehnica Iasi, on loan until the end of the season, after a week or spent in Dinamo’s training camp from Turkey.